Kinnear in Belgium to Watch Liège Youngster? Joe Kinnear has this morning been pictured by @Matt_Skeen1 at Newcastle train station on his way to London to get the Eurostar to northern Europe. According to the Newcastle season ticket holder’s Twitter profile, he claimed he was ‘after Sinclair, Ince and a young Belgian striker’ – apparently ‘6ft2 and 21 years of age’. While Ince and Sinclair have been heavily linked with the Toon by the media over the past week, the supposed Belgian target is new. Currently, there’s no ’21 year old, 6ft 2′ striker in either of the full or U21 Belgian national sides. 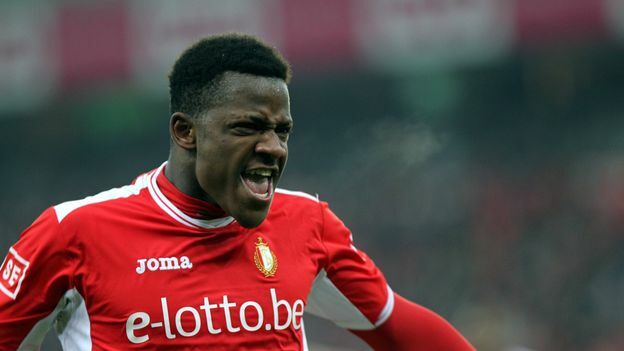 But, according to most reporting outlets, the player in question is most likely to be Standard Liege starlet, Michy Batshuayi, who we’ve been linked with in the past. Accroding to the same Twitter profile, Kinnear could not even remember the player’s name but had a photo of him. Knowing his track record, the lad could be a 7’4″ Bulgarian. But, being realistic, Batshuayi is the best bet. The youngster was born in the Republic of Congo but has spent his entire youth career in Belgium, having spells at Anderlecht and FC Brussels before signing for his current employers in 2008. He is playing this evening for his side against Belgian compatriots, KRC Genk in the Juliper Pro League. The young lad scored 12 goals in 34 league games for his club last season and has attracted the attention form numerous clubs across Europe, including Chelsea and Barcelona. He has also scored 3 goals in 5 games for the Belgium U21 side. There’s not a lot of information on the lad on the internet but he’s obviously a well regarded talent in Northern Europe and it’s good to see Newcastle supposedly expanding their scouting range beyond France. You can see the Kinnear photo here. 6 Comments on Kinnear in Belgium to Watch Liège Youngster? This is true. But Kinnear also apparently couldn’t even remember the player’s name at the station. Knowing his track record, the lad could be a 7’4″ Bulgarian. There’s no ’21 year old, 6ft 2′ striker in either of the full or U21 Belgian national sides so the best bet is this lad, who we’ve been linked with in the past. He’s cheap though! Silly little details like scoring records are neither here nor there? He’s cheap for a reason. Scoring record for a striker is not a ‘silly detail’… he’s 21 years old and has only ever scored one professional goal.